Looking east at the East Viewpoint which is in the top centre of the photo. Everything is brown because this is the fall, after a dry year. 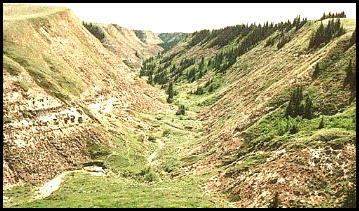 The photo below is also of the Kneehills Creek valley. 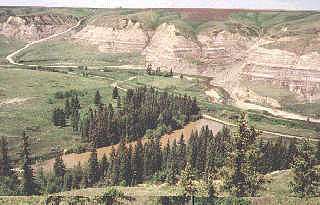 The West leg of Horseshoe canyon enters the Kneehills Creek valley from the right, just down the hill from where this photo was taken.� The East leg enters this valley just to the right of the East viewpoint and on this side of it. The groove on the right side of the West Viewpoint is a road that runs into the valley. That road is connected to the South Viewpoint. From the South Viewpoint, it is a 1/2 mile drive west and 4 miles north to reach this view. Most of it is gravel, but the part of the road that I am on is just dirt, and potentially gumbo if it rains. 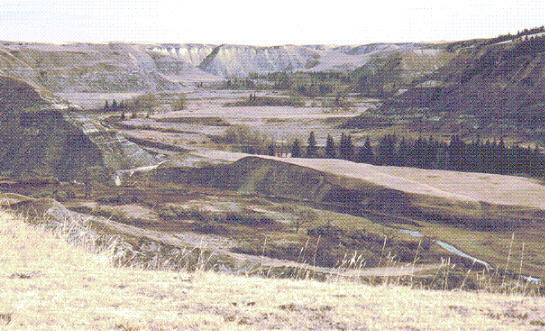 This is looking back south, down the west leg of Horseshoe canyon. It was taken from close to the West viewpoint.